Hey folks! This is the 3rd part of the Git Tips & Tricks series from Loïc Giraudel. If you missed the first post and the the second one, be sure to give them a read! And now roll up your sleeves, because this is getting wicked! Hi people ! Welcome to the third part of this Git Tips & Tricks series ! This week I’m going to start with 2 useful tricks to fix conflicts or just see diff in a graphical tool instead of command line. Then we’ll explore the magic of the Git bisect command. Finally I will show how to merge commits into a single one before pushing it. What do you think? Let’s go? Whenever you face a merge conflict, you can use a merge tool to resolve it without too much headache. Just use the git mergetool command, it will ask you which tool to use. 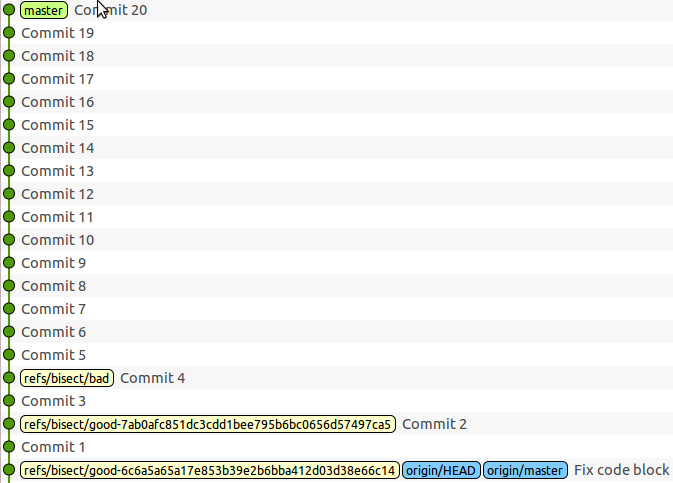 Like git mergetool to resolve merge conflicts, there is a git difftool to see diff results in a graphical tool. Unfortunately, git difftool opens files sequentially: after checking a file, you have to close the diff tool so Git can reopen it with the next file. Receiving objects: 100% (64/64), 17.83 KiB, done. This command will ask you which diff tool to use, then open the whole directory in the tool instead of each file sequencially. When a new bug appears in your application, the best way to fix the bug is to find which commit introduced it. Git has an awesome method to find a specific commit with a dichotomic search solution. The magic Git command is git bisect. This command requires 2 commits SHA1 (or references) to work: an old commit where the bug is not there and a recent commit where the bug is there. 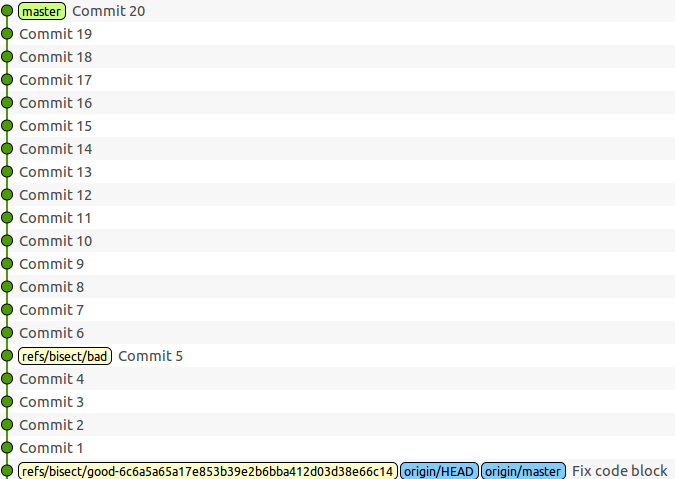 The command will checkout the commit in the middle of the interval of the two commits. Once checkout of the middle commit has been done, user has to test if the bug is still there or not and inform git bisect command. According to user answer, git bisect will checkout a commit in the middle of the first or the second half of the initial interval. Then the user has to check the bug again and inform git bisect. At each step of the process, git bisect reduce the interval and finally returns the SHA1 of the commit which has introduced the bug. Let’s take an example. 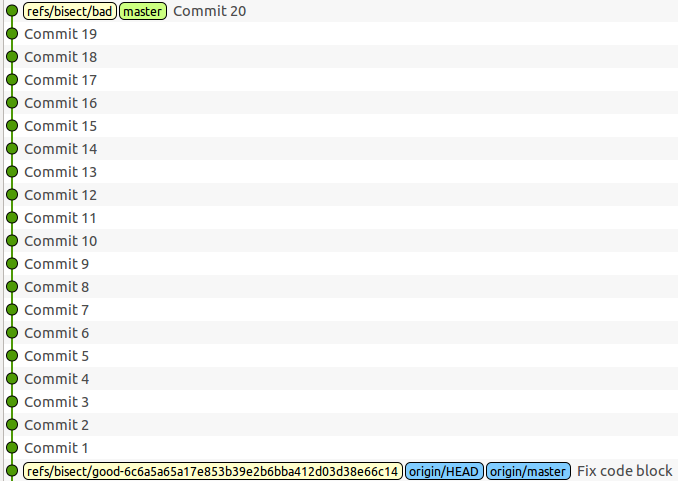 I’m going to create 20 commits; each commit adding a new line “line number #” in file.txt. One of the insertions will have a typing error “numer” instead of “number”. We are going to try to find the commit which has the typo with git bisect. Ok, I have 19 occurences of “number” and 1 occurrence of “numer”, let’s find which commit inserted the typo. To do so, I run git bisect with two commits references. I know that the bug was not there 20 commits ago and is present now. So I can pass HEAD and HEAD~20 for my two references. Git checks my interval and calculates that I will need 3 steps to find the wrong commit after current step. The commit in the middle of my interval has been checkout (“Commit 10”). If I look at my master branch in Gitg (or Gitk, Gitx or any Git graphical tool…), I can see that Git has created two references refs/bisect/start and refs/bisect/good-[…] next to my HEAD and HEAD~20 commits. Note: It’s possible to use git bisect visualize or git bisect view to see the remaining interval in graphical tool. For a console view, you can use git bisect view --stat. Now I have to check if the bug is still there or not and inform Git according to my check. The bug is still there, so I use git bisect bad to tell Git bisect that the current state is still broken. The refs/bisect/bad reference has been moved to the “Commit 10”. I check if the bug is still there or not. The bug wasn’t there in this step, so I use git bisect good instead of git bisect bad. Gitg has created a new refs/bisect/good-[…] reference. Now that I have found the commit which has introduced the typo, I can read its content to find how to fix my bug. Once the bisect is finished, I can use git bisect reset to go back to the HEAD and clean references in my branch. This command can be used in the middle of a bisect process to stop it. Sometimes, it’s not possible to check if a bug is still present on a specific commit. In this case, instead of using git bisect good or git bisect bad commands, you can use git bisect skip to ask a commit near the current one. Of course, if you skip the last steps of the bisect process, Git won’t be able to tell you which commit has introduced the bug and will return a commit range instead of a commit. If you want to avoid testing manually each step of the bisect process, you can use a test script to do it for you. Of course, it’s not always possible and sometimes you’ll spend more time creating the test than running the bisect manually. The script must return 0 if the code is good or 1 if the code is bad. The test script is really easy to write for our usecase. For real usecases, it usually requires to use a testing techno like test unit frameworks, BDD frameworks or sanity frameworks. If you are working on a big task, it’s a good thing to regularly commit, especially if you have to switch to other branches and don’t want to stash all your work. But you should remind that each commit must let the branch in a stable state: it will be easier to pick up a specific commit to another branch, revert a specific commit that doesn’t work as expected or just do a git bisect without skipping commits. You can add new files to the last commit with the git commit --amend command instead of creating a new commit but there is a solution to merge commits easily with the interactive git rebase command. 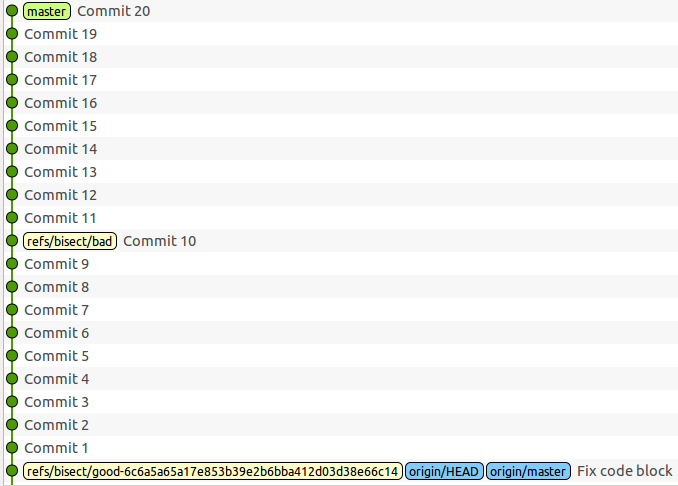 If my 20 commits haven’t been pushed to the remote repository yet, I can consider to merge them into a single commit. 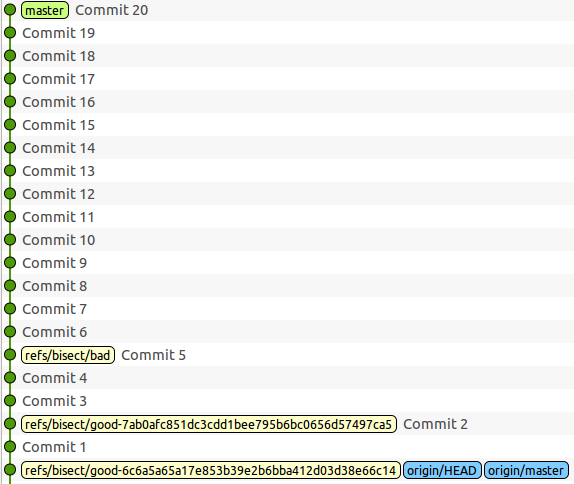 If I want to merge my 20 commits, I can replace pick by squash or s for each commit except first one. If I save the content and close the editor, Git will merge the 20 commits into a single one and then open the editor (again) to display the 20 commits messages. I can keep or change my commits message, then save and close the editor to finish the merging process. That’s all folks! I hope those tricks will help you in your daily work. Git bisect has deeply changed the way I search for weird bug : finding the guilty commit is easier than digging in the code. And merging commits before pushing help to keep a clean commit log.